Interpump HTS63 Series Pumps are specifically designed to handle rigorous duty cycles, high temperatures and chemical associated with self-serve car wash applications. Also ideal for carpet cleaning and other high pressure cleaning applications. 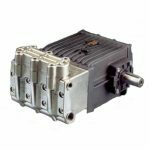 This pump offers a compact and economical design. The HT line pumps features "High Tech" packing and "High Temp" valve design. The nickel plated manifold and valve plugs provide corrosion resistant operation and help reduce damage caused by cavitation. Choose from a variety of different size pumps based on the application.